Stoke City have confirmed that Plymouth boss Tony Pulis will be their new manager, and will be unveiled at a news conference on Friday, 16 June. He replaces Johan Boskamp, who left City at the end of last season. The Potters agreed compensation with Plymouth, and Pulis has agreed personal terms to make a return to the club who sacked him almost a year ago. 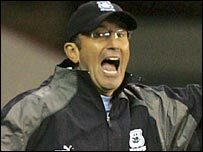 Pulis managed Stoke between November 2002 and June 2005, before taking over at Home Park in September 2005. He has also managed Bournemouth, Gillingham, Bristol City and Portsmouth - and new chairman Peter Coates has defended his re-appointment. In our league, is a direct style of play necessarily such a bad thing? "I am fully aware some supporters have been publicly voicing their opposition to the return of Tony, who was our manager for two-and-a-half years before being sacked by the club's previous owners in June," Coates said. "It is difficult to make an appointment which will be universally accepted. "The board have discussed and enquired about several managers over the past few weeks, and we are all agreed that the best candidate is Tony Pulis. "Tony has a reputation for playing a direct style of football. But in our league, is a direct style of play necessarily such a bad thing? "As we saw in the season just ended, Watford and Sheffield United were promoted playing direct football. "Tony wants to come back because he truly believes he can bring the club success, and I am absolutely convinced he can. "I did not make a recent £10m investment in the club for us to remain a mid-table Championship side." Meanwhile, Plymouth announced in a statement that they were "naturally disappointed that Tony Pulis has chosen to leave the club when it is on the brink of a most exciting era". The statement continued: "However, given Tony's obvious desire to return to Stoke, it would have been not only churlish to stand in his way, but also counter-productive to the needs of our club at this vital time of the year. "The process of identifying (a successor) with the right credentials has already begun."